When marketers embark on a formal lead nurturing strategy, opportunities for process improvement can arise in unexpected ways. That was the experience for iDirect, a leading provider of satellite IP communications based in Herndon, Virginia. 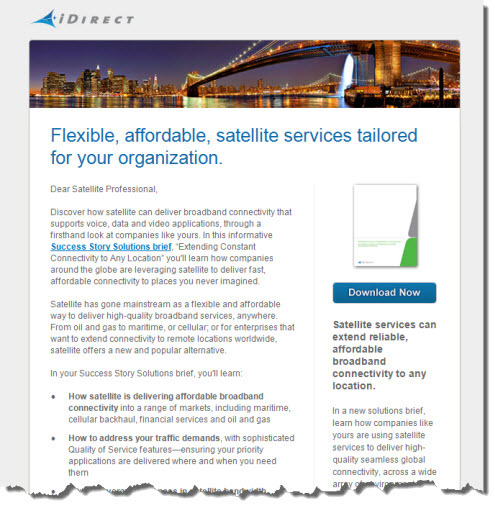 Using satellite technology for internet connectivity has particular appeal for companies with operations in remote, hard-to-reach locations, so it’s no surprise that iDirect’s market is heavily segmented, focused on key sectors such as oil & gas, maritime, and federal/military. To reach end users, the company relies primarily on a network of channel partners, including satellite operators, telecom companies, and internet service providers. All this presents real challenges for both demand generation and lead management. The company must direct end user inquiries promptly and efficiently to the sales channel, while responding to prospective partners and end users with a message tailored to iDirect’s specific experience in that company’s market. In order to improve the pace and rate at which raw inquiries converted to opportunities and deals, iDirect made the decision to improve both the systems used to manage leads and the processes behind them. First, the company invested in Marketo, a leading marketing automation platform that integrated well with the company’s CRM system, Salesforce.com. Next, iDirect sought out a partner to provide strategic counsel and advice on best practices. After interviewing a number of firms, they hired Spear Marketing Group, a Marketo solutions partner and a full-service agency known for its work in both demand generation and lead management. All-hands discovery session yields important insights, priorities. iDirect had very specific objectives for its lead management program, primarily improving the efficiency with which the company filtered, qualified and responded to an ever-increasing number of inquiries. At the behest of Spear, however, the engagement kicked off with a half-day “discovery” session intended to lay bare the way in which the company generated, managed, nurtured, and converted leads. At the meeting, attended by the iDirect marketing team and representatives from both insides sales and the field sales organization, priorities shifted. Though some issues were readily apparent, largely in the way that lead follow-up was 100% sales-dependent and thus lacked scalability, others quickly took center stage. Chief amongst these was a lack of profiling that caused many inquiries, whether government or utilities, end user or prospect, to be processed in a generic fashion. Custom workflow helps profile leads, identify high-potential opportunities. Early in the process, it soon became apparent that profiling all inbounds leads was a critical first step. Working with Spear, iDirect developed a system of classification to identify specific categories of end users and partners, a system that required the set-up of new fields in both Salesforce.com and Marketo. Well before any discussion of email frequency or offer strategy, this change empowered iDirect to begin treating leads in a very specific, targeted fashion. Next, Spear designed a custom lead nurturing workflow – a series of automated email communications to be triggered by different types of both inbound inquiries (Web registrations) and imported lists. Key to the workflow is a system of “progressive profiling” that presents an evolving set of questions to prospects as they interact with the nurturing program. The information collected by those questions will enable iDirect to craft ever more tailored communication and also allows the iDirect sales force to respond and communicate with prospects more intelligently and effectively. Spear also retooled iDirect’s lead scoring system to better prioritize leads and improve productivity for the company’s inside sales team. The new schema introduced the concept of “high value” Web forms (for example, new partner inquiries) and also negative scores – for example, docking points from prospects who visited the Website’s careers page. Working with the inside sales team, Spear used Marketo to build in a series of email alerts when leads reached a certain lead score threshold, for example, or filled out a high-value form. Leveraging social media to help maintain mindshare, keep prospects informed. One of the other opportunities identified in the discovery process related to ongoing communication with the database of existing leads. Typical of many companies, iDirect was emailing the database regularly, but the program was largely tactical and email content tended to company-centric news like press releases and product announcements. To reduce overall email frequency, add structure to the ongoing nurturing program, and also drive greater interaction with the database, Spear designed a monthly customer e-newsletter. Critically, the agency recommended archiving all newsletter content in a blog format, hosted in WordPress. This served a number of purposes: introducing greater interactivity through functionality like comments and social sharing (Facebook, Twitter), but also leveraging newsletter content to drive increased search traffic and ultimately, more inbound inquiries. Nurturing programs have a tendency to evolve over time, and iDirect’s is no exception, as the company works with Spear to build out new email tracks that address different verticals and lead profiles. However, the new program has already had a significant impact. The new lead scoring system, email alerts, and automated email response has improved productivity dramatically for the inside sales team, who now find it easier to prioritize their time and focus more on the leads that ultimately turn into genuine opportunities. Another metric: prospects are responding to the initial nurturing stream at an astounding rate, helping to improve profiling and qualify raw inquiries. Open rates for emails to new leads are averaging 35%, well above industry standards, click-through rate is 12%, and conversion rate (the rate at which landing page visits convert to form submissions) is an eye-opening 75%, underlining the fact that better segmentation and more tailored email content are key drivers for campaign response. This entry was posted in B2B Marketing, Campaign Measurement, CRM, Database Marketing, Installed Base Marketing, Lead Management, Lead Nurturing, Marketing Automation and tagged idirect, Lead Management, Lead Nurturing, Marketing Automation, marketo, Spear Marketing Group on September 6, 2011 by Howard Sewell.